Oakleigh Homeopathy Clinic in Blyth, North Nottinghamshire is close to the borders of South Yorkshire and Lincolnshire. 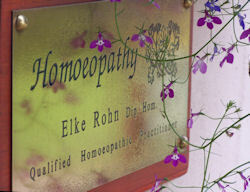 Oakleigh Homeopathy was started in 1993, after a 5 year period of intense study at the Yorkshire School of Homeopathy. I had become interested in Homeopathy when my own children were small and I had become concerned with repeated doses of antibiotics and medication that did not seem to go to heart of the problems my children were experiencing. An Introductory Talk on Homeopathy got me very interested in what must be Medicine’s best kept secret. Homeopathy is truly holistic, patients are accepted as they are – mentally, emotionally and physically. A Homeopath takes a lot of time to get to know the patient on all three levels. This is why consultations are lengthy. Homeopathic Remedies are possibly the safest form of medicine I have come across, an aspect very important to me then, in the care of my small children, and now in the care of my patients. If the remedies are not carefully matched they simply won’t work, a point born out accidentally by my children who during a lapse of attention managed to eat whole bottles full of the remedies and had no ill effects whatsoever! I have seen Homeopathic Remedies do their work very quickly and thoroughly providing the remedy was correctly matched. The level of effectiveness can sometimes be influenced by how many other medicines a patient is taking or by how far gone the disease process has progressed. Children tend to respond particularly well to Remedies. Homeopathic Remedies are useful for acute situations, such as bumps, bruises, pre-operatively and post-operatively for any operation, acute illnesses like childhood illnesses or sickness etc. But the majority of my patients come for chronic complaints, such as eczema, asthma, menstrual and menopausal problems, pregnancy problems such as severe morning sickness etc. There isn’t a condition that cannot be addressed with homeopathy as it is the person who is treated, not a disease diagnosis. It is how you experience a disease not the disease name that is of far greater importance to a homeopath.